The Yeti Speaks! : Original "Thanos and Darkseid: Carpool Buddies of Doom" art by Rafer Roberts! Original "Thanos and Darkseid: Carpool Buddies of Doom" art by Rafer Roberts! One of the highlights of this year's New York Comic-Con was getting one of the few physical copies of "Thanos and Darkseid: Carpool Buddies of Doom" by Justin Jordan and Rafer Roberts. The book has been selling well on eBay even though you can view the whole dang thing online. It's a fun story that features Dr. Doom doing what Doom does. Last week, I browsed Roberts's online store via DC Conspiracy, and I walked (not literally) away with a page of original art from the story, which you can see above. It came in today, so I thought I'd show it off. It's a comic book blog. This is pretty much what it's set up for. I made the decision to buy the page because of, naturally, Dr. Doom. Rafer has just enough Kirby in him (that sounds dirty) to draw a perfect homage to comics' greatest super villain. All four pages of the story feature Doom, though, so I had to choose which one I wanted. The cameos on page four made my choice for me. 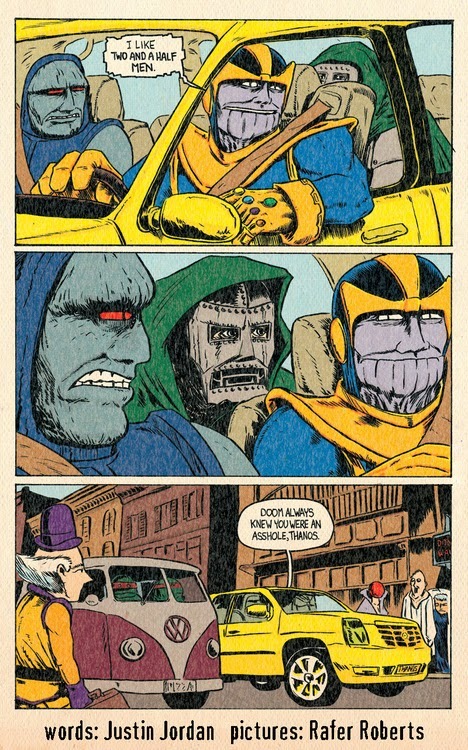 The final page of the story features not only Dr. Doom, along with Thanos and Darkseid, but also two Teenage Mutant Ninja Turtles...in their party van. And there's Mr. Mxyzptlk, too! While I was shopping, I also picked up trade collections of Roberts's ongoing "Plastic Farm" series. I got all three volumes for a great price. This is a great addition to the collection. The other three pages from the story are still available. You (you!) should pick 'em up before I inevitably do. "C-list" is being a bit generous. I do remember the Headmen from an issue of Web of Spider-Man as villains who put their heads on other bodies. Wasn't one a gorilla body? Weird.